Our selection of gifts changes frequently. Visit our store and browse our current selection! Beautiful jewelry is always a joy to wear or to give as a gift. We have a broad selection of sterling silver earrings hand-crafted by Mexican artists - both local artists and artists from mainland Mexico. Our earrings range in size from small, simple earrings for everyday wear; to large, more elaborate earrings perfect for your next fiesta. All our earrings capture the flavor and style of Mexico. From Guatamala, we have beaded bracelets. These beautifully hand-crafted bracelets are available in a multitude of colors to match your favorite outfits. Intricately beaded, each bracelet is unique - and a treasure. From La Reina Sofía, we have necklaces featuring her distinctive artwork. Each necklace is double-sided, with colored images on one side, and sepia-toned images on the other. The images are encased in glass - which both protects the art, and makes the necklaces comfortable to wear. La Reina Sofía is the talented young artist who created the whimsical Allende Books logo seen at the top of the page. We also carry sterling silver necklaces and rings, both with and without stones. The perfect gift for any reader - we have sterling silver bookmarks. Each bookmark is delicately crafted and represents Mexican culture, featuring such images as Mayan-style birds, or Aztec gods. 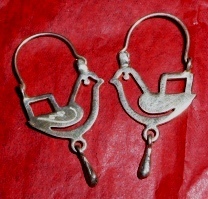 We also have beautiful pre-Columbian reproduction sterling silver figurines. We carry a selection of beautiful textiles from both Mexico and Guatamala. Most items are either hand-woven or exquisitely hand-embroidered. Choose from scarves, table runners, table cloths, purses, and blouses. To brighten up that bare spot on the wall, we carry paintings and etchings from local artists and artists from the Mexican mainland. Most art is in traditional Mexican styles and colors, but we also have more contemporary works. Additionally, we have framed photographs of some of the areas surrounding La Paz, showcasing the Baja peninsula's natural beauty. Also take a look at our historical-reproduction maps of either Mexico, or just the Baja - available either framed or unframed. Religion is a big part of Mexican culture. For anyone wanting to celebrate the religious culture in Mexico, we carry retablos (a folk art made using religious iconography, generally oil paint on copper), crosses made from Mexican tin-work, and crosses of elaborately painted wood. We also carry molas (a textile art, made from multiple layers of hand-sewn appliqué) from the Cuna tribe in Panama, Oaxacan tin-work, hanging copper masks, and other copper wall art. 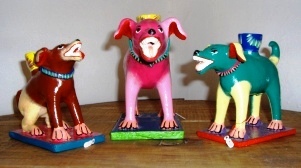 A nicho is a type of folk art. Similar to a shadow-box, nichos may combine elements of Catholicism, indigenous beliefs, and contemporary culture. In general, nichos are brightly painted, feature one or more glass panels, and are made of materials easily purchased or found in the home. Often, a nicho starts with a converted cigar box. A traditional nicho is frequently used as an extension of a family altar, venerating a favorite saint, the Virgin of Guadalupe, or a loved one who has passed on. 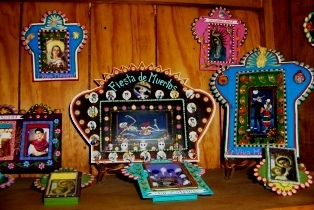 They are commonly included in Día de los Muertos shrines. Contemporary nichos may or may not have a religious theme. Often, they depict popular culture or make a political statement. Mexican pottery makes a fabulous gift! We have several styles - colorful Oaxacan animals, Oaxacan black pottery, pre-Columbian reproduction figures, and rustic pottery from local artists. From a talented artist in Chiapas, we carry a broad selection of hand-crafted felt stuffed animals, including deer and goats with colorful horns, fish, frogs, sheep and lambs (with fur from real sheep), parrots, peacocks, monkeys - and whatever other animal struck the artist's fancy! 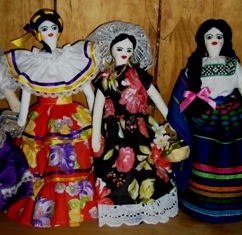 We also have dolls - from traditional, finely-clothed señoritas; to hooded Zapatistas. If you don't know exactly what you are looking for, there are lots of other gift items to choose from. In addition to the the items listed above, we have bookmarks with local scenes, tin magnets, maracas, gourd rattles, tin mirrors, picture frames, papel picado (cut paper) streamers, notebooks, calendars, cards, postcards, and much more! Come on in and browse. You may find the perfect gift for that hard-to-buy-for person on your list!